ABOVE: US Bankruptcy Court records for Burisch. ABOVE: Burisch listing of number of creditors, assets at time of filing, and estimate of debt owed. 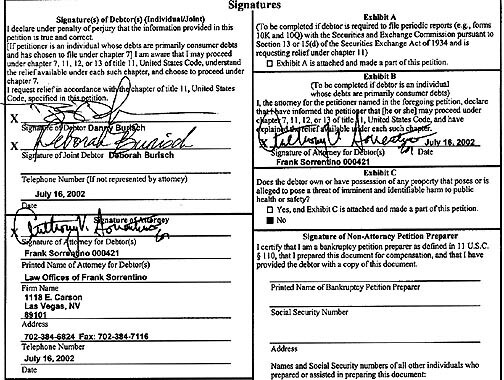 ABOVE: Bankruptcy document with signed declaration of Dan Burisch and Deborah Burisch. ABOVE: Occupational listing of Dan Crain, listed as "homemaker"
ABOVE: Listing of earnings from employment.